Can a working model railway be built for £35? I’m going to try and I’ll give £100 to charity if I fail. I’m always up for a challenge in my model railways so when an idea that came up in a conversion with MRE reader Aron I couldn’t let it pass. 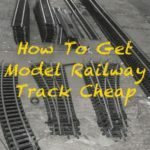 Is it possible to build a model railway from scratch for £35? This set me thinking? Can it really be done? Train sets alone start at £40 and often cost several hundred pounds. And then there’s the wood for baseboard, all the models, scenery materials and electrics are taken into account. 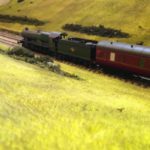 Just take a look on eBay and you can find model railways selling for thousands. It’s easy to understand why many people think model railways are expensive. After consideration, I think it can be done and I’m going to have a go sharing my progress, how I’m doing it and ideas right here. (If you’d like to join in and have a go please do! Even better, drop me an email — via the contact page — and we can share progress here on Model Railway Engineer). And just to make things interesting, if I can’t do it I’m going to give £100 to charity. No questions. No ifs or buts. £100 cash to a charity if I haven’t built a £35 model railway by Christmas. Very simply, to build a fully operational model railway for £35. Gauge, size etc decisions don’t really matter and will come later. 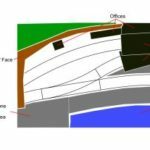 It must, however, be a model railway with track, trains, buildings and scenery and on a permanent/semi-permanent baseboard of some kind. This is not about making a train set on the floor or table. As said, this is going to take some doing but through a combination of DIY and scratch building (making models from scratch), clever buying and borrowing techniques from the pioneers of the hobby I’m confident I can achieve this. There’s really only one main rule: when finished by Christmas 2017 I’ll have a working model railway, on a permanent base, with buildings, scenery, track, electrics, controller and trains and have spent no more than £35. I’ve excluded tools, paints and glues from this as they have other uses but that’s it. Everything else is to be recorded and included in the final price. But also because by demonstrating that model railways don’t have to be expensive and how to make one so cheaply, it will hopefully inspire more people to try out this hobby and give it a go. There’s also another cause behind my madness. Over the years, I’ve been inspired by the great railway modellers: John Allen, Henry Greenly, C. J. Freezer and John Ahern to name just a few. These gentlemen built their railways from scratch with nothing more raw materials, ingenuity and creativity. 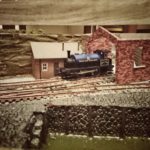 Thanks to plastic kits we can now build model railways are a lot quicker to create and certainly more easily but the hobby is losing this DIY knowledge. 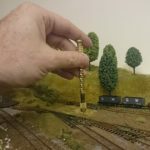 Making a model railway for £35 will, by necessity, require all but the trains and track to be built from scratch in the way the pioneers of the hobby did so I’ll be researching and sharing these DIY tips and techniques to capture them for posterity and also rekindle a lost art. Aron has already got a head start on me, as seen in the photo right. He been given the woodwork from a builders mate and has already started the basics of the track work. Choosing gauge, layout size, theme and track plan. End of August. Aquire basic materials: wood, track, electrics. End of September. 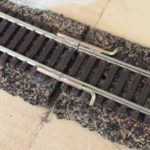 Lay and ballast track and electrics. End of October. Get rolling stock and make scenery and/of buildings. End of November. Add finishing details. 2nd Week January (allowing for Christmas holidays). By 2nd week of January, I’ll either have a working model railway for £35 and have beaten the challenge or I’ll be writing a cheque for £100 to a charity. 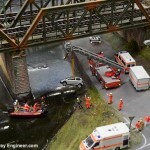 Why not join me and build your own £35 model railway. Start by picking a gauge/layout size and theme today and drop me a line (here, on Twitter, or Facebook) with your choices. Update: For follow up progress reports, see the £35 model railway challenge.